City Desk, Marblehead:Ê Models for the IrresistiblesÊfashion show, from left, Jan Johnston, Myra Gulko, Kelsey Doub, proprietor, Sharon Russell and Betsy Dowling, all are from Marblehead. 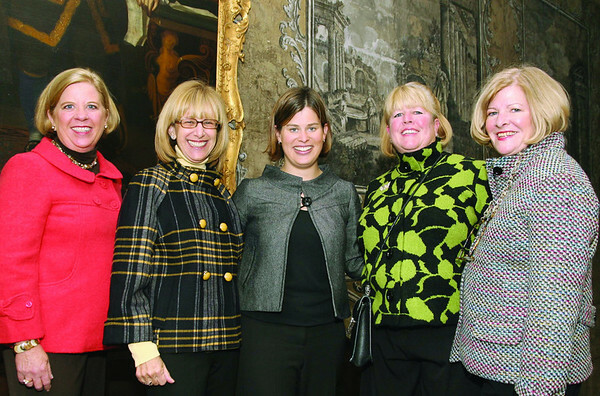 They are standing in front of the rare hand painted wall paper at the mansion, one of only two in existence, at the benefit for the Marblehead Museum and Historical Society, Thursday, at the Jeremiah Lee Mansion on Washington Street. Photo by Frank J. Leone, Jr.